It’s now several years that pastry chef Salvatore De Riso (from Minori in Campania region) realizes calendars with a sweet theme, always with a painstaking attention to contents and graphics. 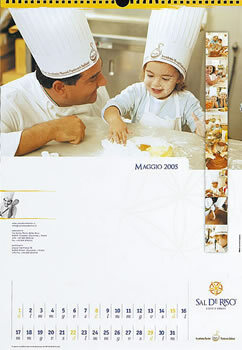 For 2005 he focused his attention on children and their relationship with sweets, himself being the father of the little Anastasia. 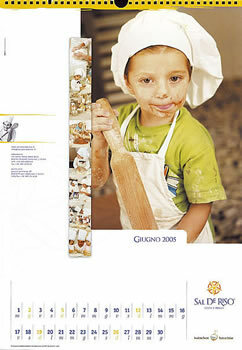 His laboratory in Tramonti, over Minori, received a group of children which, dressed with uniforms and toque, enjoyed themselves preparing yummy pastries. The photographer Michele Pappalardo immortalized their amusement and intense conducting, as well as the colours, the smiles, the light-heartedness and curiosity. After the inevitable “historical” picture of Salvatore in which he is in front of a cake for his first birthday, in 1967, every month a face intent on working the various ingredients was chosen, besides a rich series of clicks capturing the funniest and most amusing moments. 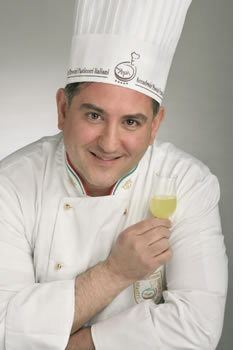 2005 is for Salvatore a year of big changes: with his production having a great success at international level, he has launched a new brand, which origins from a graffiti design in the Roman Villa in Minori, with the registered name “Sal De Riso – Costa d’Amalfi”. 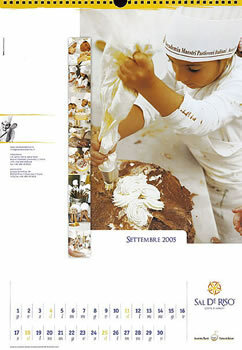 “The idea was chosen among 36 brands – says the pastry chef -, but this was the most evocative, in colours and shape. The name, instead, wants to be more international and was suitable to be registered, since “Salvatore” was just too common”.